As with most challenges, having the right tool for the job can be the critical difference between failure and success. With the rise of industrial agriculture in the United States in the ’60s, the market for new technologies and tools for small scale producers all but disappeared. Now that is about to change. 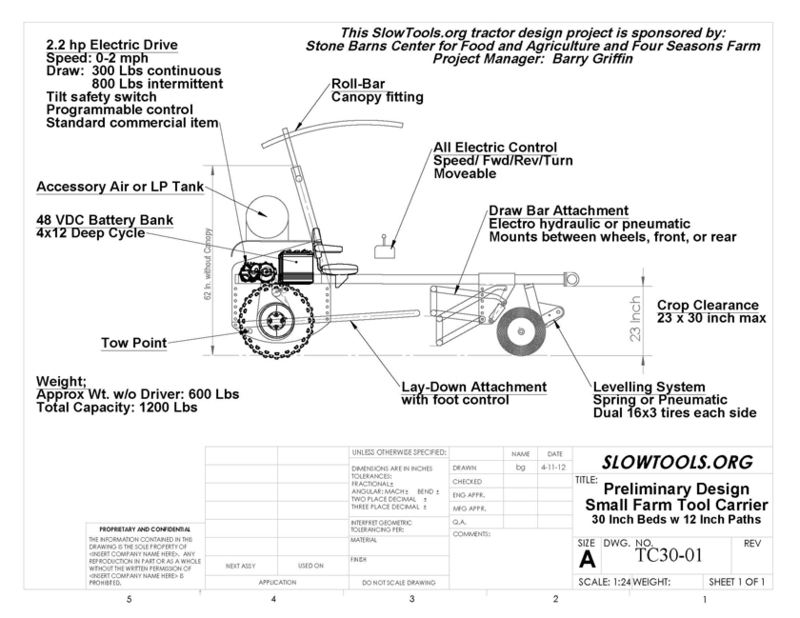 A group of farmers, engineers and manufacturers have been actively developing, advocating for and distributing Slow Tools—appropriately scaled, lightweight, affordable and open-source tools for small scale farmers. 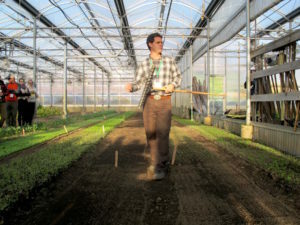 Today, “the list of 34 tools is a relic although most are still being worked on presently,” Jack Algiere, the Farm Director of Stone Barns Center, told MOLD. “The focus of the group has expanded but in general is divided into these categories: electric power equipment, cultivating tools, washing/packing equipment, structures (greenhouse/tunnels/coops) and energy systems (O2 compost radiant heating, AD systems).” The Slow Tools working group is being incubated by the Stone Barns Center for Food and Agriculture, an 80-acre working farm in the Hudson River Valley just 25 miles north of Manhattan. 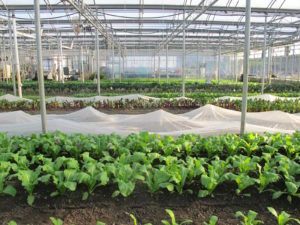 The farm serves as a lab for resilient, sustainable agriculture and is a center of vegetable, livestock and soil-building experimentation and demonstration. Besides their farm and educational activities, Stone Barns also trains young farmers through their Growing Farmers Initiative, hosts the annual Young Farmers Conference and manages the Virtual Grange, an online community for beginning farmers. Leading the conversation for Slow Tools are longtime advocates for sustainable agriculture including Eliot Coleman, pioneer of the American organic farming movement, inventor and author from Four Season Farm in Maine, Ron Kholsa, organic farmer and engineer of Huguenot Farm in New Paltz, Josh Volk of Slow Hand Farm in Oregon, Adam Lemieux, Product Manager of Tools and Supplies for Johnny’s Selected Seeds, Barry Griffin, design engineer, and Jack Algiere. As part of their mission to co-create Slow Tools with designers, Algiere hosted a mechanical engineering student from Purdue last summer who worked on two main projects: the design of a bed-shaper tool for the greenhouse and improvements to the Stone Barns radiant compost system (if you’ve eaten anything sous vide at Blue Hill at Stone Barns, it was probably cooked using the captured heat from the compost). Eliot Coleman also hosted two student engineers at his farm. Sharing one story from their collaborative process, the students worked on finding a solution for protecting young plants from cucumber beetles. From left to right: Jack Algiere, Adam Lemieux and Eliot Coleman at the Slow Tools Summit. 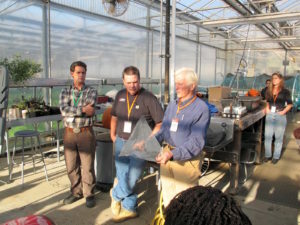 Coleman shows a prototype for a cucurbit transplant protector co-created with engineering students. Adam Lemieux shared the story around prototyping the group’s most recent tool, a soil blocker for the standard size 1020 germination tray. 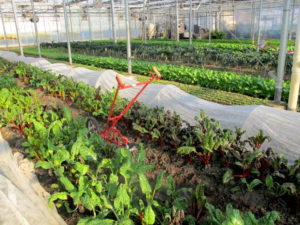 For years, small-scale farmers have been hacking the standard trays to work with the available soil blockers. Until last year, no one had addressed why these two tools didn’t work seamlessly together. 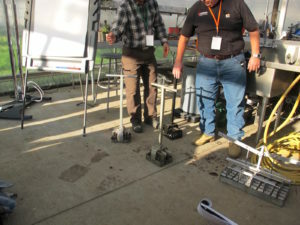 The group realized that the soil blockers from Europe were designed to fit standard European trays and that the 1020 tray was an American standard. Now, the group is working with an English manufacturer to prototype and test a model designed to fit with American standards. This singular example highlights the potential for design to revolutionize the way that small to medium scale farmers produce and harvest food. 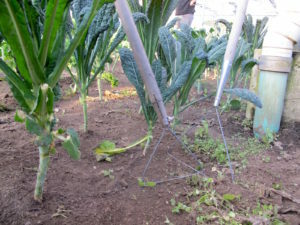 Taking the principles behind the popular Lucko Wire Weeder, the team added a handle to have a more ergonomic way of weeding in winter high tunnels and in between rows of tiny greens. An idea that started with farmer Michael Kilpatrick, Eliot Coleman and his engineering interns prototyped a number of different widths and shapes for testing on the farm. The above are DIY prototypes but Johnny’s sells a more sturdy model. A leaf raker that agitates the surface, right over the top of the bed and takes care of thread weeds and stops pythium blight for winter seeding. An electric tiller that doubles as a raised bed former. Unlike a traditional tiller, the user walks it back and forth instead of pushing it from behind. An upgrade to the Planet Jr. Wheel Hoe, this wheel hoe has an offset handle and the leaf lifter guides all the foliage through the whole tool. It effectively weeds and cultivates. Although this adapted colinear wheel hoe itself is not ideal (the handle is not offset, the clearance is limited), this French tool has a lot of interesting implements and features developed for it. In the demo, Lemieux called out the wingbolts and brackets used and the general system for adapting to different types of implements. Coleman also discussed the importance of designing so that “you’re pushing the tool, not pushing the wheel,” so that the line of force between the handlebar and the tool are aligned. This wheel hoe comes in three sizes and disturbs soil with thread stage weeds while the blade cuts larger weeds below the surface. 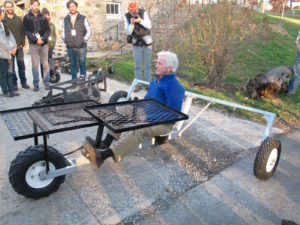 Eliot Coleman demo’ed this pedal-powered seated cart from Europe, originally designed for harvesting asparagus. 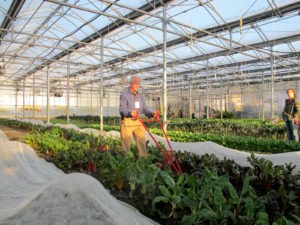 He uses it for picking, transplanting and weeding, an example of a more ergonomic way of working.